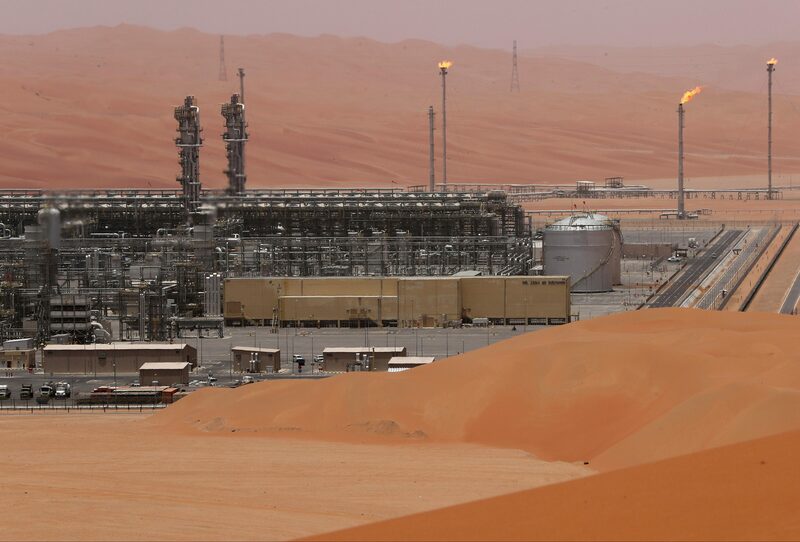 General view of the Natural Gas Liquids (NGL) facility in Saudi Aramco's Shaybah oilfield at the Empty Quarter in Saudi Arabia May 22, 2018. The issue, split into maturities ranging from three to 30 years, saw the oil company tighten its price guidance. Aramco on April 9 sold a $1 billion three-year tranche offering investors 55 basis points (bps) over U.S. Treasuries, a $2 billion five-year tranche at 75 bps over the benchmark, a $3 billion 10-year tranche at 105 bps, $3 billion in 20-year notes at 140 bps and $3 billion in 30-year bonds at 155 bps, a document issued by one of the banks leading the deal showed. Aramco hired Lazard as financial adviser for the bond deal. JPMorgan, Morgan Stanley, HSBC, Citi, Goldman Sachs and National Commercial Bank arranged the bond issue.